The first thing she does is double-click on an image, which loads it up into Preview. This is a natural act for virtually any non-technical person; you see a file you want to view and you double-click on it. Great! Then she wants to see the next image. The navigation within Preview doesn't work because by double-clicking on an image she has only selected a single image. It's only if she has selected a group of files that Preview allows any navigation between those files. Where this breaks down in Preview is that non-technical users don't grasp the concept of collecting a group of items and performing an action on them. By navigating to a folder they already have gone into a collection of items. Why should I then have to select all of those items before performing a group action on them? This is especially true with an application that is designed to help a user quickly scan through files without having to load a large app to see them. If I want my wife to use Preview to view all of the images in a folder I need to tell her to navigate to that folder, click on the first file in that folder to ensure it has focus, press Command-A to select all of the items (or click-drag the mouse on all of them), then press Command-O to open them. She does this once every month or so, not often enough that she's going to remember it. An option I tried for her was to use the Cover Flow view. While it's very obvious how to navigate, the small size of her MacBook screen and the large areas of screen real-estate used for navigation controls leaves some pretty tiny images. I use iPhoto on my Mac Pro and that's what I use to browse my photo library. So why don't I just have my wife use that? There are two options for her using iPhoto: the first involves her importing all of the images I take (and I take a lot) into her local copy of iPhoto. That's far too much work when all she really wants to do is quickly browse through the last month of photos that have been taken. The second option is that I have iPhoto loaded on my Mac Pro and share the my collection. This presents two problems: sharing a 40K photo sized iPhoto library over a wireless connection is... S...L...O...W. It also means I have to have iPhoto loaded at all times on my Mac Pro in order for it to be accessible. Both are non-options for me. Will this break a UI model? Well, it's really only a change on a single application: Preview. It doesn't imply that all applications need this behavior. Since the goal of Preview is to quickly and efficiently scan through files I would think this would be a great little change and in keeping with the purpose of the application. If it's too much then make it an option in the Preview preferences. At this point I'd take a terminal hack to make it work that way! As always, if you have a suggestion for a better way to handle this please drop it into the comments below. I also encourage you to follow me on Twitter. Sure, you'll get a lot of other non-Mac stuff but hopefully you'll get some value out of it as well. First off, with Cover Flow, you can expand the size of the pictures. Between the 'flow and the name portion are three small lines. Merely grab those with your mouse and pull down and that will increase the photo/'flow size. Column view of the finder is another way. When you select a file in column view, it brings up a preview in the next column. If you expand the size of that column, the size of the preview will increase while you are still free to navigate in the prior column. @Scott Edwards: Thanks for the comment Scott. Coverflow is pretty limited on sizing options and the Column view preview is again very small. I don't really notice it on my dual screen Mac Pro but when I view this on the 13" screen of a MacBook it's very limited. "I go to the pictures using finder (icon view), click Edit / Select All, then double click on the first icon. It loads it up into Preview, then I select View / Slideshow. If I like the photo I add it to my iPhoto with the button at the bottom. Later I load up iPhoto and share the pics with Facebook." I truly love having a power-user daughter. Another option (once you've done your daughter's select all) is to hit opt-cmd-y. This will automatically start a slideshow of everything selected. Am I missing something? Why not drag the whole folder to Preview? I think this is an issue where educating the user is the best solution. Double clicking a document open that document in the program it belongs to. That's standard behavior and it is not standard behavior that a document based program would navigate through more documents in the folder. Yes, there are some programs that are made to be folder based but Preview isn't one of them and that isn't Preview's norm. BTW, it is possible to drag a folder of photos to Preview. Donationware Xee behaves the way you want it to as well: Open a photo in any folder, then hitting the space bar or PgDwn pages through the other photos in the folder. It also allows for cropping, resizing, etc. Reminds me a bit of irfanview from the Windows world. Worth a look. "Now she navigates to the folder, selects the file and clicks the little eyeball. Quick Look is even faster than preview but has a small problem: if I click the Full Screen button it loses the ability to navigate through the rest of the images." @Tom: Full-screen Quicklook applies only to the file(s) selected. 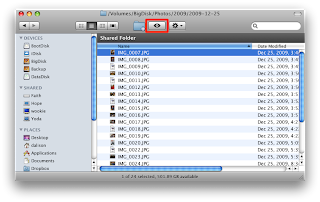 If you select all of the files in the folder and go into a fullscreen Quicklook, it will start a slideshow. Thanks for the tip, it is great for reading comics too which I am a avid fan. Now all you have to do in the Finder is navigate to and select the folder and click the application icon in the toolbar. @Matt: I didn't realize that would work - thanks! Then again, that's why I encourage comments. @Anon: That's an excellent point. What I try to point out in the blog post is that the purpose of preview is to quickly view a document; more often than not I've found preview to be used to scan multiple documents. I would argue that having it load a single document and then disabling navigation controls doesn't add any value to the user, but more often becomes an issue for users that meant to select more than one file. This kind of design issue is often raised in UI meetings: where does one stray from the strict rules to enable an action that better serves what a user expects to do. @SLS: Thanks for the tip on Xee - I'll check it out. So far I'm really digging Phoenix Slides but it's great to see a comparable product. @Lee: Outstanding suggestion. It's funny but only after 2 years on the Mac have I started to explore Automator and what it can do. Once again, worthy of a blog post on the topic. Thanks to all of you for the comments. Additional suggestions or application recommendations are encouraged. @Scott: I know how it works, I think you're confused by what I meant. In regular window QuickLook, one can use the arrow keys to change the selection of the Finder window and thus what the QuickLook window displays. You lose that ability in full screen mode, though you can return keyboard focus to the Finder window without losing visual focus on full screen QuickLook. Turns out to be easier than I thought to start a slideshow from a single image in a Finder window though: though the arrow keys themselves stop working, command-a still works. I really think that changing Preview would be a disaster. Apple sets the pace for UI's and once one of their most-used applications breaks the mold, where does it stop? Another "things you didn't know you can do with Preview" item: if you open more than one PDF file in Preview, you can drag pages from the sidebar of one Preview PDF window to the sidebar of any other Preview PDF window, and then save the altered file. Very handy! @Anon: Obviously I disagree that it would be a disaster or I wouldn't have recommended it. I understand the stance that says "a standard is a standard" but it can be carried too far. If an internal counter was placed in Preview and monitored the number of times people opened a single file, then tried navigating to the next / previous using the buttons in the toolbar I would imagine they would find that a significant number of people do that. I look at Preview as a beefed up version of Quick Look. All I would like to see is the way Quick Look works be extended to Preview. That or Quick Look is fixed so that when you move it into Full Screen mode you can navigate with it the same way you can when it's windowed. Either one works for me. I definitely hold with the stick to standards crowd on this issue. No need to rant about it, just when things work the same across all applications it's easier for everybody. You suggest that by navigating to a particular folder I am interested in all of the files in that folder. That is almost never the case. I don't want Preview or any other application second guessing my intentions. Both Preview and Quicklook follow the convention of previewing only the selected files. Quicklook retains its navigation abilities while in full screen mode. When the cursor is moved over the image, the nav controls are overlaid on the image. They continue to function whether visible or not. Your whole concept creates problems. When you click on the first file and then navigate to the 'next' file, what do you mean? The next file alphabetically? Or by date? or by size? The folder can be sorted any way you wish, so how is the computer going to know which one you want? More importantly, the entire concept is a huge problem. For any Mac action, you have to open the file first. If the software needs a file, it is supposed to ask before opening it. You're suggesting breaking that protocol (so now the user has to remember when the computer will open files for them and when it won't). The real disaster is when someone learns to create a virus or trogan and make it a .jpg file. Under your scenario, Preview would open that file without asking permission. Boom. I think it's ridiculous to ask Apple to violate one of the most basic principles there is (you must open a file before you can do anything with it) simply because your wife can't remember to select all the files before opening or to use any of the other ways to accomplish the same thing. There are times when it makes sense to break the rules, but this isn't even close to being one of them. Preview's behavior is analogous to how things work in the real world. When I take an Apple from a bag and juice it, my expectation is that only the apple I chose is affected. Likewise, when I dump the entire bag of apples into the juicer, I expect all the apples to be juiced. It would be disastrous if the laws of physics caused unintended objects to be affected by our actions. In Preview, if I select three images in a folder and open them, my expectation is that when I view a slideshow, only those three images will appear. If suddenly other images were to show up after viewing the third image, that would be unexpected, as I signaled my intention when I chose the three images. Perhaps the multi-slide mode you are suggesting would only kick in when one image is chosen, but that raises the question why then and not when two folder images are open? For some people, what you are suggesting might simplify things, for many others it would be mind boggling. @David Chilstrom: Thanks for the comments David. I do see your point, but I look at Quick Look and Preview as serving the same purpose. Preview just allows me to do a little more like annotating and printing. I expect them to behave similarly when viewing files. If I select a single file in the Finder and activate Quick Look on it then I can continue to navigate through the files that adjoin it in that folder. If I select a group of files and activate Quick Look it only navigates through the files selected. All I am looking for is Preview to perform the same way. I do believe that Quick Look is broken because when I switch to full screen mode I lose my navigational abilities if I only have a single file selected. It's difficult to explain to the user that when you switch to full screen mode that you lose the navigational controls you just had a moment ago. I don't believe that switching from windowed to full screen should have an impact on navigational controls, especially since if I activate Quick Look with multiple files selected and switch to Full Screen I can continue to navigate. Preview is different than a typical application too. The primary toolbar contains controls for navigating through the files I am viewing. For all intents and purposes Preview is simply yet another way of quickly finding or viewing the file I want. Finally, as to your Slideshow example for Preview, I would think that the only time I would ever want to run a slideshow is if I have more than a single file selected - all it does is automatically (or on command) advance me through a series of images. If standards are to be strictly enforced than Slideshow should be disabled if only a single file is detected. @Anon: As I mentioned above, I would want it to work the way Quick Look does from a navigation standpoint. I don't think your "navigating over a trojan infected file" argument holds much water; if I have a file I suspect of being a trojan the last thing I'm going to do is leave it sitting around. Chances are I'm going to select it and preview it anyway. One thing to bear in mind is that Quick Look is not an application, it's a feature of the Finder. So, broadly speaking, the way Quick Look responds to keystrokes will be similar to the way the Finder behaves. Which is not necessarily the way a typical application will behave. I agree one hundred percent with you David, this is one of the biggest gripes I've had with my Mac since I converted from a long time Windows user. If I have a large folder full of photos and other folders full of photos, I have to press ctrl + a then ctrl + click to deselect every other folder in the current folder. Then I click open, if there are a lot of photos preview lags the hell out of my computer as it seems to open every photo at the same time, and sometimes it even opens them up in two or more preview windows. If I just click one photo, it shows me one photo and will NOT allow me to look at the one before it or the one next to it. Someone asked how it would decide which photo to look at, that's a stupid question, obviously it will scroll depending on how the photos are arranged in the folder (which is up to you...) Why would I ever want to look at just one photo and be restricted to viewing only that? On a Windows you open a picture and you CAN view that one picture only if you like, but you also ahve the convenience of being able to look through as many photos after in that folder as you like without having the annoying extra steps. Also they don't all load at once, they load one at a time, as you are viewing them. Give us the option at least, geez. Other than that, Macs are easier to use than a Windows for the most part. BTW you should disable captcha word verification on your blog, it makes it so difficult to post a comment and you'd definitely lose comments as a result. I'm pretty technical - well, I'm a geek actually.